Do you agree with Ian’s view on creative content and contrived content? It’s rare to find an article discussing SEO that’s still relevant 5+ years after its publication. 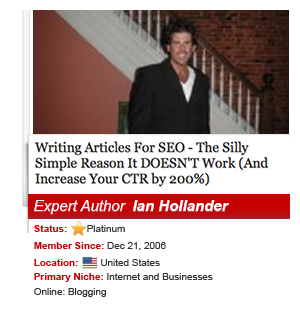 When Expert Author Ian Hollander’s article “Writing Articles For SEO – The Silly Simple Reason It DOESN’T Work (And Increase Your CTR by 200%)” appeared in my search, I have to admit I was skeptical, but I was also intrigued. Let’s take a walk through the main points of Ian’s article. We couldn’t agree more. Creative, custom content attracts followers and LEADS because it’s driven with a passionate force: you. Contrived is a good word here. It brings to mind all of those spammy articles that plague our submission queues as well as “writing for SEO” practices. In our book, contrived content would be defined as often thin, unoriginal, derivative content that is built around keywords, not insights. It fails because it often doesn’t fill the needs of readers and it lacks the staying power of “creative content.” If it’s searched, contrived content will only meet a referential need (e.g., reader finds answer and closes the window), but it’s important to bear in mind that this form of content is up against EVERYONE else in your niche. Yes and no. We agree; it’s easy to get wrapped up in “quick SEO fixes” because it’s easier to believe it’s the SEO’s fault instead of the quality of the articles in question. Also, you should always followup with a compelling call-to-action in your Resource Box. However, there are “minor tweaks” like using the long-tail method in your article title and implementing the co-occurence technique in your Resource Box to increase your brand association and click rate. Should you focus your entire efforts around these “tweaks”? NO WAY. Always let quality be your guide. Let’s expand on “small directories.” Publishing content with a reputable article directory will help you increase your bottom line, whether it’s to build exposure, drive traffic, or increase your credibility. However, where many Expert Authors go wrong is placing their content with an ill-reputable directory. Posting to more article directories or websites is not better. It’s just more. Publishing original content to reputable article directories with quality guidelines and a community of quality authors will help you succeed in your efforts. We found Ian’s article simply sensational. Do you agree with Ian’s take on creative content and contrived content? What about his take on SEO? Do you think article writing has changed greatly from 2006 to today? Let us know in the comments section below! Yes I agree with you Content is very important part of the any Site or Article. If your content is real and unique then it is good for your site Ranking. Ian great insight. I was make my article quality higher than writing an article for SEO purposes. I think readers would buy more (or take whatever action) if they felt like the article was clear, good, and coherent. No offense but my greatest suggestion to you would be to hire someone who knows the English language to be your writer or at least use a native English speaking person as your editor. I like you article thanks for sharing with us. I’d like to say that from the beginning, I’ve dismissed all of the SEO theory – I found it to be manipulative gaming of the search engines, this is why I’ve never engaged in it. In fact, I write what I believe is important, not much worrying about what everyone might be searching for or trying to use specific terms to attract views. The way I see it the “long-tail” approach makes sense to me, but other than that, I am into anti-SEO strategy, choosing to travel the road-less-traveled, and in the end I find I was right. nice article. give some idea to write a good article. now i have learn more about the head, middle and tail of the article. what the important things that must we do is to find a right keyword to include to our article. thanks for the author. I spent a lot of time learning SEO, only to discover by trial and error that the best SEO is not SEO at all but just good, intriguing content. Whenever I try and follow the SEO rules taught by the so-called gurus, my articles seem to be thin and lifeless. Hooray for good content! At my age, late sixties, I just wrote what I knew about and tried to make the content have value to my readers. The whole SEO thing was a puzzle to me so I ignored it. Today, I am aware of SEO but have made a choice to do just what you said…add value. Howard, it’s great that we started unaware of this “shortcuts” which made us even more passionate in what we do. Cheers! Content will alwas be king. Good idea. Always write from the heart! We always tend to write what we think will assist people, rather than what will get google points. After all, google’s rules change! That reminds me of the need of the article’s heading or topic to be at least 100 characters, which must incorporates all the contents of the article from the very heading. Thus, the reader gets the whole facts from the start. And, they if are appealing, he will not put down the reading, till, he finishes. Creative, passion felt “content” is king. I agree with you that rich and unique content is great for site rank. Because I have a strong background in the art of persuasion it made more sense to use my persuasive abilities in print than to sacrifice them for unnatural purposes. However when I tried setting up a blog of posts without seo it seems the engines did not know what to do with them. Therefore I think at least a skeleton attempt at on page SEO makes sense.